"Kill Marguerite and Other Stories" collects thirteen risk-taking stories obsessed with crossing boundaries, whether formal or corporeal. Narrative genres are giddily mongrelized: the Sweet Valley twins get stuck in a choose-your-own-adventure story; Mean Girls-like violence gets embedded within a classic video game. Protagonists cycle through a series of startling, sometimes violent, changes in gender, physiology, and even species, occasionally blurring into other characters or swapping identities entirely. One woman metamorphoses into a giant slug; another quite literally eats her heart out; a wasp falls in love with an orchid; and a Greek god impregnates a man's thigh with a sword. More than just a straightforward celebration of the carnivalesque, though, these fictions are deeply engaged, both critically and politically, with the ways that social power operates on, and through, queer bodies. Megan Milks lives in Chicago. Her work has been included in "30 Under 30: An Anthology of Innovative Fiction by Younger Writers"; "Wreckage of Reason"; and "Fist of the Spider Woman: Tales of Fear and Queer Desire," as well as many journals. She is the editor of the anthology "The &NOW Awards 3: The Best Innovative Writing," and co-editor of the volume "Asexualities: Feminist and Queer Perspectives," published by Routledge. Davis Schneiderman, author of Drain, and the DEAD/BOOKS trilogy: Blank, [SIC], and Ink. 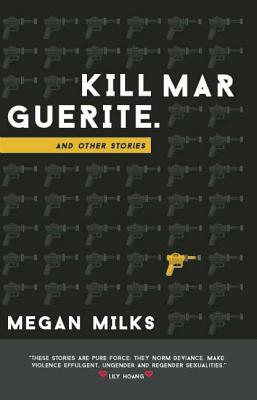 "The stories in Megan Milks' Kill Marguerite are pure force: they norm deviance, make violence effulgent, ungender and regender sexualities. Each story is a kitsch throwback to back in the day when reading was a fun choose your own adventure; or, these stories are not just carnal, not just animalistic, not just girly: they're amphibian, our full corporeal tenderized to satisfaction, which is to sayhot."